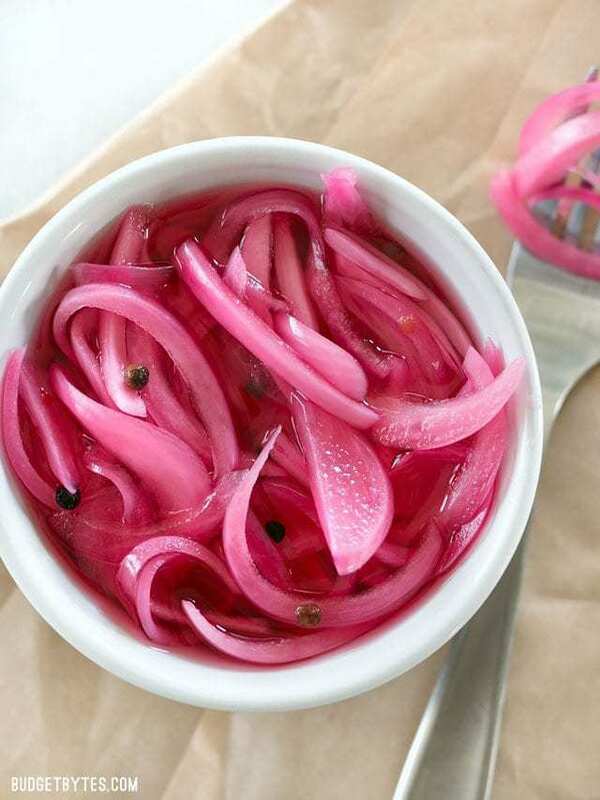 Pickled red onions are AWESOME on tacos, sandwiches, salads, pizza, nachos, and lots of other things. Instead of thinking of these pickled red onions as a substitute for fresh red onions in recipe, think of them as a non-spicy alternative to pickled jalapeño. That tangy pickled flavor tastes great anywhere you’d normally use a pickled jalapeño. Keep your pickled red onions refrigerated and in the brine and they’ll last 3-4 weeks in the refrigerator! The flavor gets better over time as the onions marinate. There are a million different ways to make pickled red onions, so I’ve provided a very basic version below. As you begin to make them more often, you can start to tweak the flavors to match your preferences. Experiment with the seasonings and spices by adding ingredients like bay leaf, star anise, or red pepper. 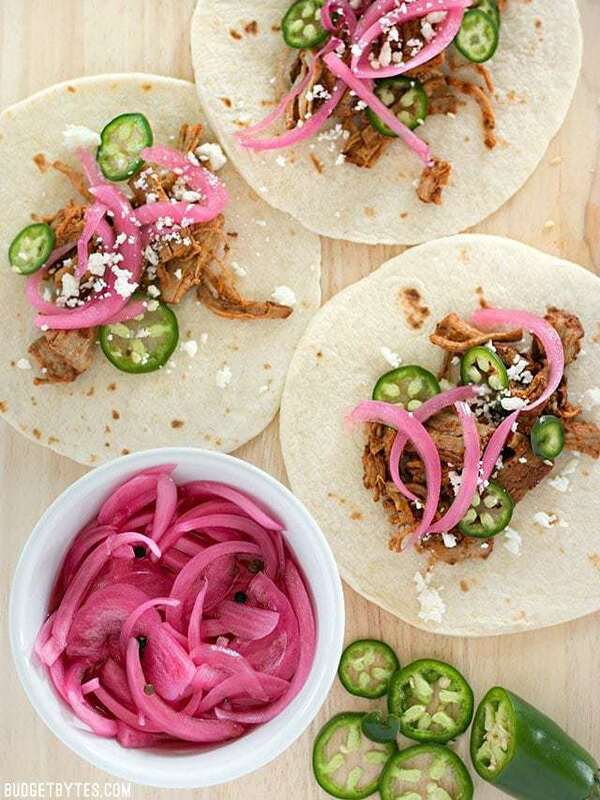 Pickled Red Onions are a great way to use leftover red onion and are a great topping for tacos, sandwiches, pizza, and more. Thinly slice the red onion and peel the garlic. Place the onion and garlic in a large glass or ceramic bowl. Add the sugar, salt, and peppercorns to a small sauce pot. Add the vinegar and stir until the sugar and salt are dissolved. Place a lid on the pot and bring the mixture up to a boil over medium-high heat. Once boiling, pour the vinegar over the sliced onion and garlic*. Press the onion down so all the pieces are submerged, then let the mixture cool to room temperature. Once cool, use the onions immediately or transfer the onions and all the brine to a lidded non-reactive container (glass, ceramic, or plastic) for storage in the refrigerator. The onions can be stored in the refrigerator for 3-4 weeks. *For onions that remain crunchy, pour the boiling vinegar over the onions in the bowl. If you prefer soft onions, add the onion and garlic to the sauce pot and allow them to boil in the vinegar for 1-2 minutes before transferring to a non-metal bowl to cool. Start by thinly slicing the red onion (I used about 3/4 of an onion, or 1.5 cups once sliced) and peeling one clove of garlic. I also used 1/2 tsp peppercorns. I didn’t have a separate jar of peppercorns, so I just used a few peppercorns from my pepper grinder. Place 3 Tbsp white sugar, 1.5 Tbsp salt, and 1/2 tsp peppercorns into a small sauce pot. Add 1 cup white vinegar and stir to dissolve the sugar and salt. If it doesn’t all dissolve, it will once the vinegar gets hot. Place a lid on the sauce pot and bring the vinegar up to a boil over medium-high heat. As they cool the onions turn the most brilliant magenta color! Transfer the onions and the brine to a non-reactive container (glass, ceramic, or plastic) with a lid for storage in the refrigerator. You can use the onions right away, but they get even better with time in the refrigerator! I just pickled these onions for carnitas, and my tacos turned out restaurant quality. The onions were tangy with just the right crunch to balance the fatty and rich carnitas. I don’t think the leftovers will last the week. I tried but couldn’t pop the top from my pepper mill. The onions tasted just fine without the peppercorns for those folks having similar difficulties with their pepper mill. I have tried several other recipes, but this one is the one! Love it ! Thanks for the recipe. I gave it a shot, and while it was good, it’s sweeter than I usually like my pickles. Will the brine still work ok if I reduce the sugar or even leave it out? Will I need to replace it with more salt? Hmm, I’m not 100% sure. I made these for the first time today and I only used 2 traps of sugar and they are really good. My wife went bonkers over them. I only used 3/4 TBSP. of sugar in mine and I think I will enjoy the taste more as well. Thank you for asking about the sugar/sweetness factor because I prefer it less sweet too. It was nice to see directions for a crisper outcome, I personally like them with a little cruch. This recipe was simple and very easy! Thank you for posting it. If you don’t have time to make these, you could just stick the leftover onion in the fridge. That’s what I usually do. I peel the outer papery layers off the whole onion, then just chop as much as I need for a single meal. The rest goes into a sealed container and into the fridge. I usually use them within a week or two and haven’t had any issues! Hmm, it depends on how much you like the flavor of AC vinegar. :) That extra flavor will most likely come through in the end product. Technically speaking, though, it will work. How in the heck did you get the lid off that grinder? Those little guys are tough! Yes, it WAS tough… and honestly I’m not sure how safe it is. I think the key is to pry it off kind of sideways, instead of straight off, so that one side gets pulled above the lip first. crazy thought but.. you COULD just get peppercorn without the grinder; they are usually sold in generic bulk packages for a lot less than those small glass bottles; I get a pepper blend from a local farmers market that has black, red, pink and white peppercorns and the package is less than $2 and has easily 4 times more peppercorn than you get with the mccormick glass containers sold at most grocery stores. cracked or crushed peppercorn is better than ground peppercorn in many situations (such as rubs for meat) – i just roll them out on the cutting board and use the flat side of a butcher knife to crush them when needed. Do you think this would be good with regular white or yellow onions? You know, I’ve never seen pickled yellow or white onions and there must be a reason… I’m just not sure what the flavor would be like. I’ve pickled vidalia onions quite a bit and they are excellent. Vidalia onions are sweeter and not quite as crisp but they are quite good pickled. – I like using red onions for the visual effect as well as being delicious but you can certainly pickle other types of onions. Pickled white onions are very popular here in the UK. I still prefer red, though. I love pickled red onions! I had never had them until I traveled to Peru, where they were served at almost every meal. :-) Now I am just going to have to make them myself! As soon as I saw the photo of your tacos, I ran out to get the pork. I had everything for the pork rub and pickled onions (and other toppings) on hand which is why I love Budget Bytes recipes. I’d love to see more recipes like this that turn leftover scraps that would normally go to waste into useful alternatives. Could you skip the step of soaking the onions in a bowl, and let them soak directly in the jar you’ll be using later? Also, how did you get your peppercorns out of that grinder? I can get the same disposable McCormick peppercorn grinders up here in Canada, but for the life of me I can’t act actually open them to access the peppercorns. This also means I can’t just refill them. Maybe it’s a regional difference in the design. I’m having the same problem with a McCormick peppercorn grinder that I bought in California. LOVE pickled red onions! I actually do a lacto-fermented version with pickle pipes – they’re PERFECT on salads! Beth, Thanks! I just made a batch with an onion that I grabbed at a farm stand on my way home. It came out great, as it has the perfect salty/sweet/sour combination of ingredients. I am now going to try it with some pickling cucumbers. I put the mixture directly into a wide-mouth quart jar and skipped the bowl. One trick I learned is to put a much smaller, /small-mouth jar inside the larger jar on top on top of the mixture and then put on the lid. This pushes the onions down and keeps them submerged when you put them in the fridge. I’ve often pickled radishes, but not onions. This is a great idea, thank you! I know you’re from my area and fyi. ideal Market carrys pickled red onions. Must have on Mexican night at the house. Do you feel these onions could be frozen with this method? Hmm, I suppose, although I don’t know if vinegar freezes… Interesting question! Vinegar freezes. There’s an old recipe for freezer slaw that uses vinegar.